Our kitchen renovation is moving along...I've been without a kitchen sink for three weeks so I'm definitely ready for this to be done! Here's a little peak of what is done...I'm loving everything so far! Over the peninsula are two Luna Rod light fixtures from Schoolhouse Electric. The bulbs are Edison light bulbs...they look retro and modern at the same time and give off the nicest light. 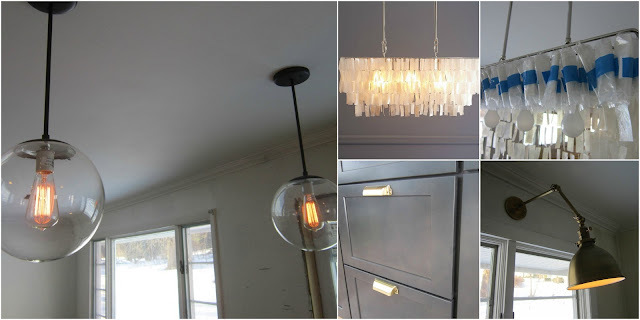 I choose the West Elm Large Hanging Capriz Chandelier for over the dining table. This is what it's suppose to look like when it's done. The next photo is how it looks now. Every single Capiz shell is individually wrapped in plastic and blue tape to ensure nothing broke during shipping. I'm spending hours unwrapping each one!! The brass pulls are the Bedford brass awning cup from the Martha Stewart Collection from Home Depot. Only $1.98 each but they look so much more expensive! Another Schoolhouse Electric fixture--the Princeton Senior in natural brass which hangs over the kitchen sink. My husband came home from work and said he feels like he's in Grand Central Station. I'll take that as a compliment! Lighting is one of my favorite design elements, and I love what you have chosen! I had read that capiz fixtures are a patchke to unpack. I also read on a company's website how many arrived broken when they weren't wrapped. Just think how fanstastic it will look over your table. That light over the sink is amazing. I wouldn't have thought to put a fixture like that over the sink--it looks great! Thanks Terree--I love the lights, too. Can't wait till I have a real finished kitchen! Thank you--it's coming along and I'll post more soon!